A new World Bank study, released ahead of Prime Minister Narendra Modi completing two years in office, has said that the India’s national poverty rates fell much more sharply between 2005 and 2012, when the UPA government ruled the country, compared the decade between 1994 and 2005. 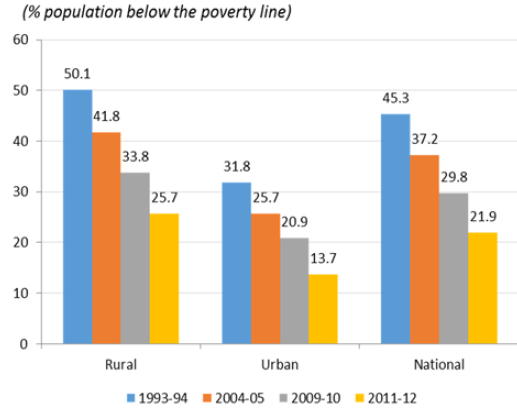 The study, carried out by Ambar Narayan and Rinku Murgai, and circulated as a policy research paper, says that poverty rates “decreased from 45 to 37 percent of the population between 1994 and 2005”, and “fell a further 15 percentage points in the next seven years, with similar patterns seen in both rural and urban areas”. “This was a three‐fold increase in pace, as the country reduced poverty by 2.2 percentage points per year during 2005‐12, relative to the 0.7 percentage point per year decline between 1994 and 2005”, the World Bank study, titled “Looking Back on Two Decades of Poverty and Well-Being in India”, says. In absolute numbers, the study, while accounting for the rise in population, says that the number of poor people remained “stubbornly high” at over 400 million in the eleven years between 1994 and 2005. However, in the next seven years, 137 million people (roughly 20 million per year) escaped poverty”, with 270 million people living in poverty in 2012. 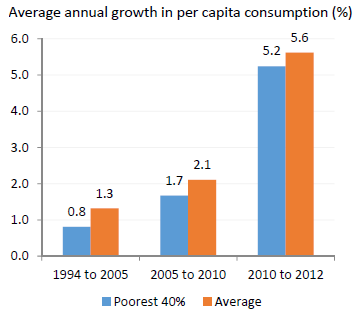 “Consumption growth of the bottom 40% averaged an anemic 0.8 percent per year between 1994 and 2005, and increased four‐fold to 3.3 percent per year between 2005 and 2012, averaging more than 5 percent annually during the last two years of this period”, the study says. “The decline in illiteracy among adults – from 38 percent in 2005 to 30 percent in 2012 – is matched by a 9 percent increase in the share of adults who have completed secondary education or more during this period”, the study says.